Clayborne Carson was born June 15, 1944 in Buffalo, New York, but grew up near Los Alamos, New Mexico, where his family was one of the few black families in the area. According to Clayborne, this led to a “strong curiosity about the black world” and a later fascination with the Civil Rights movement. At age 19, while attending school at the University of New Mexico, Clayborne participated in the historic March on Washington in 1963. What influenced him most about the experience, he relates, was not the famous “I Have a Dream” speech, but the people he met at the March. He participated in other civil rights and antiwar protests as an undergraduate, and many of his later writings reflect those experiences, describing the importance of grassroots political activity especially within the African American struggle for freedom and equality. Clayborne Carson went on to earn bachelor’s, master’s, and doctoral degrees from the University of California at Los Angeles. After finishing his doctorate in 1975, he immediately began teaching history at Stanford University. 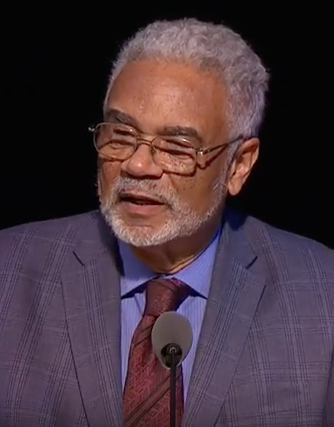 In 1985 he was approached by Coretta Scott King, who invited him to direct a long-term project to edit and publish Martin Luther King Jr.’s speeches, sermons, correspondence, publications, and unpublished writings. Subsequently, Dr. Carson began the King Papers Project, which has produced seven volumes. Twenty years later, in 2005, Dr. Carson founded the Martin Luther King, Jr., Research and Education Institute to support the work of the King Papers Project. He has been named the Ronnie Lott Founding Director of that institute. Dr. Carson is the Martin Luther King, Jr., Centennial Professor of History at Stanford University and serves as a member of the global council of the California International Law Center. He has lectured in Britain, France, China, South Africa, Zimbabwe, and Tanzania about Martin Luther King Jr. and other figures and movements relating to the black struggle. He has also appeared on multiple radio, television, and news programs. Clayborne Carson is married to Susan Ann Carson, the managing editor of the King Papers Project. The Carsons have two children, a son and a daughter, and are now proud grandparents as well. They live in Palo Alto, California. Dr. Carson has dedicated his life and work to preserving the legacy of Martin Luther King Jr. Dr. Carson’s insight, born of years of study, and his passion for civil and human rights both in history and the modern world are evident in the forum address he delivered at Brigham Young University.